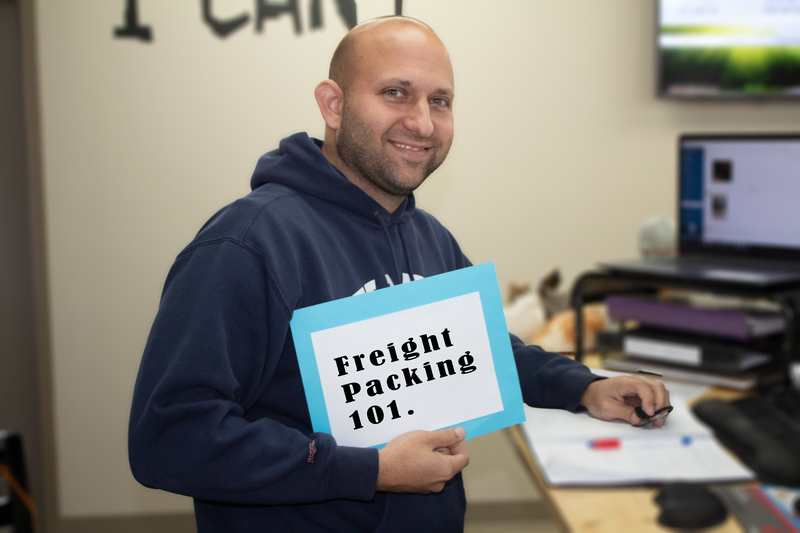 If you’re new to the world of shipping, you’re probably confused about the process! Weight, dimensions, pallets, shrink-wrap and inventories. Where do you start? At AM Transport Services, we’ve been in the transportation industry for 30 years. During that time, we’ve helped a lot of shippers get ready for their first, 50th, and 200th shipments. We asked our freight experts to compile their best tips for preparing and packing cargo for shipping. Here’s what we found out! Create an inventory first. An inventory is a complete list of the goods you’re shipping to your customer. Each item will be listed on the Bill of Lading. A Bill of Lading is simply the contract between shipper and the freight carrier. We recommend you assign a value to your goods and document the value in your inventory. It’s a good idea to know exactly what it would cost to replace the items in your inventory. This value might be assigned by your insurance. It’s your job to pack the freight–the carrier’s job to move it! Pack from the inside out! A box is only as good as the packing inside of it! Pack your boxes and pallets for strength. Take your time and use quality packing materials! 1. Pack products in boxes, cartons, crates, or other protective containers. If your shipment contains multiple boxes, use pallets, so shipments is easily loaded onto the truck with a pallet jack. 2. Are your packages fragile or non-fragile? Examples of fragile (breakable) items: glass, computer or computer parts, electronics, furniture, household goods, artwork. Examples of non-fragile (unbreakable) items: clothing and footwear, paper or plastic, machinery parts, canned goods, tools and hardware, carpeting. 3. Pack both fragile and non-fragile items in sturdy new boxes or containers. Boxes should be full with no air. Extra air in the box compromises the safety of your product making it vulnerable to damage. Individually wrap fragile items with bubble wrap and leave room in box for extra cushioning. For extra caution, bubble wrap first box containing fragile item and pack it in second larger box (typically 5 inches wider and deeper than first box). Fill remaining space with cushioning material. 4. Label boxes clearly. Each box must be labelled with both shipper’s and consignee’s addresses, as well as, phone numbers, bill of lading numbers, and shipment date. All labels should be printed for maximum readability, and attached to the top surface of each box in the shipment. 5. Tape boxes closed with three-inch wide, durable plastic or reinforced tape. Tape across flaps and seams of the top and bottom seams of the box. For extra caution, tape seams and flaps at least twice for better security. 6. Stack boxes together evenly on best pallet. Need more information at pallets–check out our guide to pallets. Align or stagger boxes, corner to corner with no overhang. Stack boxes with heaviest boxes on bottom. Evenly distribute weight on pallet and in boxes. A flat and even top surface minimizes damage to product. Use cardboard corner beads around the pallet. Flat cardboard sheets placed between rows helps solidify loose boxes. 7. Use shrink-wrap to secure boxes to pallets. Your pallet should be a solid unit. It should move as one solid piece. Use quality shrink-wrap–at least 70 gauge! To begin, wrap shrink-wrap around the base four or five times, making certain the edge of shrink-wrap goes underneath each corner. Pull tightly. Pull tightly again! Work your way up from the base. Pull shrink-wrap around each layer, joining them securely to first base layer and on up the stacked boxes. Pull tightly! The key is to pull as much stretch out of plastic as possible while wrapping. Don’t be stingy! Wrap each section four or five times. When you get to the top, check security of unit by pushing against boxes. If they move, wrap your way back down the stack, and check again. For extra caution, twist the plastic for maximum strength as you wrap. It takes a bit more effort, but it’s worth it. 8. Pull it all together one more time with nylon straps! 9. Remember, the experts at AMT are here to make your shipping experience painless. Questions or concerns–no problem. Give us a call–we’d love to help!